Guitar stands, like many guitar accessories that do not directly relate to music, are unfortunately the least priority to a lot of people. When you pay a couple of thousand dollars for your guitar, gig bag, tuner, amplifier, picks and other items altogether, you probably are not too eager about the thought of reclining your precious guitar against a wall or laying it on the table. So if you are standing in the middle of your room with one hand holding the guitar and the other facepalming yourself for having overlooked the most basic and practical item for your instrument, a stand, you are not the only one. So let’s discuss some of the most important aspects of stands and possible options that might make your research for finding the best guitar stand for your budget and needs a little bit easier. If you just spent all your money on the accessories that you have been pumped to buy for months and you are really close to being so broke that you have to call your parents again for another loan that will definitely and irreversibly destroy your self-esteem, well… you should probably not be putting any money into accessories. But if the circumstances are not as grave and you have, let’s say $10-20 to spare, why not put it into the safety and protection of your guitar rather than another round of beers on a Friday night? 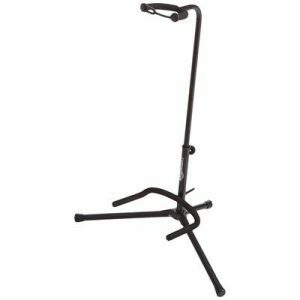 If your budget is around that price range than On Stage XCG4 Black Tripod Guitar Stand is the right model for you. It comes in black color and has a sleek and stylish design. This model is a good quality, affordable stand with a velveteen rubber padding. Rubber end caps prevent any kind of slippage, so you don’t have to worry about any accidents. The rod with locking keyway fits almost any acoustic, bass, and electric guitar and it does not take up too much space. If I had a dollar for every time I have decided to economize and get an AmazonBasics item instead of a different (brand with no “basic” in it), I would probably have enough money to buy something this no “basic” in the title like another dream guitar of mine. But the thing is, I am not that cheap (some might argue with that statement), AmazonBasics has often surprised me with a great quality for a product at half the price, so it has always been go-to for me in a lot of categories. AmazonBasics Tripod Guitar Stand might not sound as exciting as some model with an innumerable amount of incongruous letters in it and a “Pro” at the end, but it definitely does not disappoint. 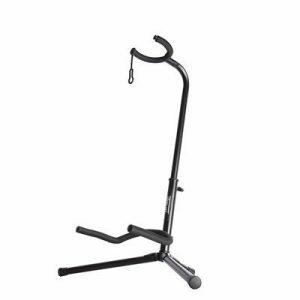 This stand is compatible with electric, acoustic, and bass guitars, it also has a security neck strap and soft foam arms so that your guitar does not get any accidental scratches. If you just got your guitar for your birthday or bought it with you allowance money, I think a product that can be affordable without compromising the quality, is a great option for you. 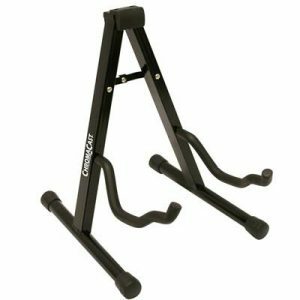 In the same price range as the other two, we have a ChromaCast CC-MINIGS Universal Folding Guitar Stand. This is an A-Framed model with stable construction that will fulfill all your needs for holding and protecting your guitar. It is lightweight with a metal construction and rubber feet to stop slippage. Also, the soft foam stepped yoke will keep your guitar safe and cozied up. One big issue that some people have with A-Frame stand is that sometimes their shape is not the best for keeping the guitar in place if someone bumps into it. If you are keeping your stand somewhere with not as much “traffic”, A-Frame might good great for you. Plus, this problem is not consistent with every model, so you should probably look at the A-Frame models that you are interested in and maybe find them in your local store and check them out for yourself. 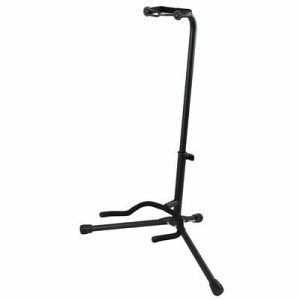 Created to hold acoustic or electric guitars this Gator Frameworks GFW-GTR‌-1000 Guitar Stand is a great model for you if you are looking for something affordable but do not want to compromise the quality. This model features folding legs, rubber neck restraint to keep your guitar from falling over and breaking, in case of an accident. Apart from that, this stand also has a rubber support that will not mess up the finish of your guitar. It is extremely compact, making traveling and keeping it in small spaces very easy. I have mentioned that there are stands that will cost up to several hundred dollars but to be honest I do not think they are worth it. 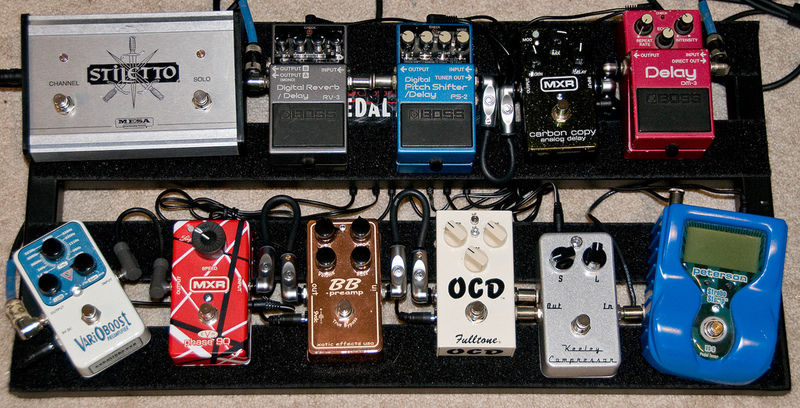 If I was buying a new guitar stand and had a ton of money to spare (I said “if”, okay? ), I do not think I would buy the really expensive models anyway. Yes, sure they might have one or two extra features and look extra cool, but the main function of a stand – to hold up and give support/protection to your guitar, is there in cheaper versions, too. Look at a stand as a home for your guitar. You are probably planning on keeping it for a couple of years and do not want to spend money on something that will not fulfill all of your requirements. Apart from that, it would not be too shabby if the stand you buy is not so hideous that every time you looked at it, you realize how big of a mistake you made. Or maybe, just mayyybe, you want a stand that will not be too generic and will stand out in your room, making it not just functional but also cool looking. I would say, out of all the three models, Neewer Universal Portable Adjustable A-Frame Guitar Stand would be the one for that task. 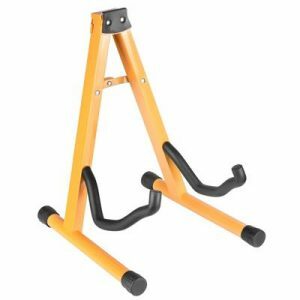 This A-Frame stand comes in black and yellow colors. The yellow model will probably be a nice edition of color, but at the same time it will not overwhelm you and make you regret every single one of your decisions. This Neewer model has velveteen rubber padding protection at all contact points with guitar, rubber fit to prevent slips and is compact and portable. You spend months deciding on what guitar model you want and a couple of more months (who are we kidding, probably years) on saving up money to buy that guitar. You are exhausted and think that the hard part is over. Deciding on a stand is going to take 5-10 minutes at most, you think very naively. Sorry to disappoint, you my friend, there are thousands of varieties of stands for your guitar. Well, this sounded like a bad thing but it definitely is not. Now, you can research and decide on a stand that fits your needs perfectly. There are different types of stands ranging from A-Frame, wall hanging, to racks and much more. The stand you will choose depends on how much you are willing to spend on it. There are models that cost about $10 and then there are posh ones that cost several hundred. Make no mistake, the fact that a stand costs several hundred does not mean that it will be the best fit for your guitar and circumstances. Another factor to play a big part in your decision making is the amount of space you are willing to allocate for your stand (and guitar). Do you live in a dorm? Then you should be looking for something very compact, maybe a wall-hanging stand. There are also A-Frames which are quite affordable and easy to travel with. On the other hand, if you are not a newbie and have several guitars you might think of buying a rack or multi-guitar stand. Another big thing to keep in mind when choosing your stand is the finish of your guitar. Contact between metal and plastic wears the finish off, so if your guitar has a nitrocellulose finish, you need to be careful. If the finish is polymer-based, then you will probably be fine. Be it a $10 A-Frame stand or a couple of thousand dollar premium stand, the fact that you are getting a stand is already a great step forward. Hopefully, the list of some of the factors that need to be considered when deciding on which stand you should be getting was helpful because man, oh man there is a plethora of choices out there that can spin your head. Hopefully, some of the models featured here will be interesting for you, otherwise good luck with your endeavor of finding the best guitar stand for you and your baby (I mean the guitar… not trying to be weird).